Send in your Chuck E Cheese application for a chance to work in one of the most popular family restaurant chains in the United States! Founded in 1977, the company currently owns over 590 locations all over North and South America and the Middle East. This guide will offer instructions for the general Chuck E. Cheese application and hiring process. You can also find other useful resources for the Chuck E Cheese job application, such as minmum age to work at Chuck E Cheese and Chuck E Cheese interview questions examples. Note that the Chuck E Cheese hiring process may differ from country to country, to conform with the local legislation. Submit your Chuck E Cheese application today! The minimum Chuck E Cheese hiring age is 16, so as to stay in line with employment laws. Therefore, all applicants need to be over this age limit in order to be selected for one of the positions at the company. If you are looking for to get employed at Chuck E Cheese, then you will have to submit your application online via the official careers portal. To access the portal, just go to Chuckecheese.com/careers and you will find all the information you need about the company. Go to the “Be Part of Our Team” section to find all the departments you can apply to. Click on the Search button for the sector you are interested in to find all of the available positions. If you are interested in one of the Chuck E Cheese jobs in the Cast Members department, then you will be taken directly to the online application form. The first thing you have to select is the exact location you are looking to get employed in. Select the state you reside in and the choose the Chuck E Cheese restaurant you are looking to get hired in. Fill out this Chuck E Cheese application form for a chance to work as a Cast Member. Then you can proceed to fill in the Chuck E Cheese application form with your full contact details, the exact hourly job position you are interested in and the date you would be available to start working. Pay special attention to the section where you are asked to point out why you would like to work for the company because this is one of the pre-interview questions. Then you are asked to provide a few details about your previous work experience and finally, you will have to list the exact hours you would be available for work each day of the week. After you submit your profile, you will be contacted by the Chuck E Cheese hiring specialists in regards to the interview process. If you are looking to apply for one of the Chuck E Cheese careers in the Support Center or the Management department, click on the search button to view all the job openings. Conduct your search according to keyword, employment status, and location. For this section of the Chuck E Cheese application form, you will have to answer some employment questions. You will have to certify that you are above the hiring age limit and that you are legally allowed to work in the U.S.
Answer these employment questions for this section of the Chuck E Cheese application form. For this section of the Chuck E Cheese application form, you will have to upload or type in your resume. Please note that this section is mandatory. Add your full contact details to this section of the Chuck E Cheese application form, so that the Human Resources department can contact you. 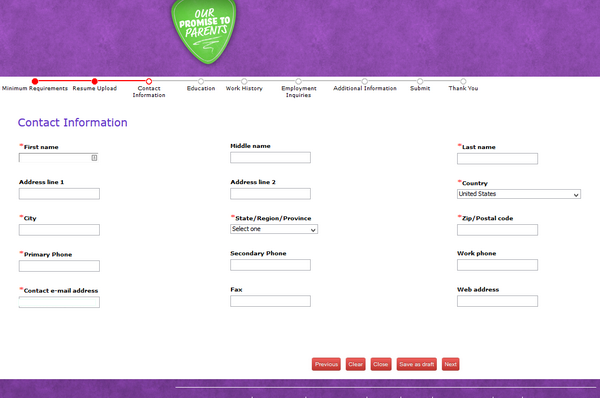 Add your contact details to this section of the Chuck E Cheese application form. Add the man details about your education background to this section of the Chuck E Cheese application form. Make sure to list all the programs in chronological order. Provide the main details about your education for this section of the Chuck E Cheese application form. List the main details about your professional background for this section of the Chuck E Cheese application form. 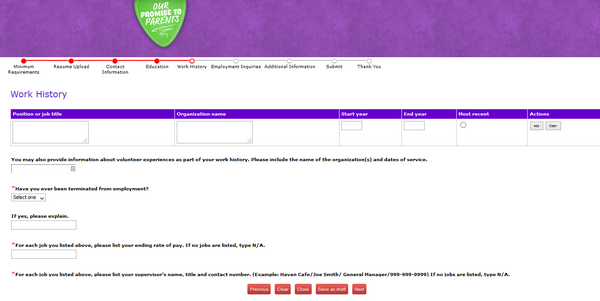 Please note that you will be required to provide the contact details of your supervisor. you will be asked for your permission to contact your previous supervisor(s) for references. Provide the main details about your work experience for this section of the Chuck E Cheese application form. The questions included in this section of the Chuck E Cheese application form might vary from one position to another. You will have to mention your main job preferences and your salary requirement. Answer these general questions for this section of the Chuck E Cheese application form. This section of the Chuck E Cheese application form includes EEO questions. If you are comfortable with disclosing such information about yourself, you can mention your gender, race, and ethnicity. This data will enable the company to build a more diverse workplace. When you are done filling out the Chuck E Cheese application form, you can submit it to the hiring specialists for assessment. Remember that you can check your application status after this by simply logging in the portal. Check the Chuck E Cheese job application portal periodically to find the latest job openings in the department you are interested in. The Chuck E Cheese salary for the entry-level position begins at minimum wage and it can get as high as $9.00 per hour for experienced employees. Additionally, Cast Members are entitled to tips. Go to the Chuck E Cheese job application portal to find all the newest listings in the Management department and submit your jobs and employment form today! The exact contents of the Chuck E Cheese benefits packages are determined by according to career level, schedule type and the duration of the collaboration between the employee and the company. 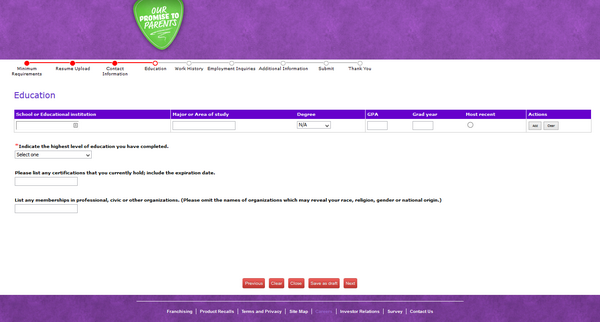 Fill out all the sections of the form, even those that are not mandatory. Upload your resume to the Chuck E Cheese online application form rather than typing it in. Double check that the contact details you have provided are correct. Provide honest answers to the questions in the Chuck E Cheese application form. Make sure you add the items in the Education and Work History sections in chronological order. Remember to do a thorough proofreading of your Chuck E Cheese application form before you submit it for assessment. Edit out any incorrect information so that the hiring specialists can get the best possible version of your employment form. The Chuck E Cheese hiring process includes two main steps: the assessment phase and the interview process. The formal assessment of the job applications will be conducted by the Human Resources department and the most promising candidates will be selected for the interview process. Depending on the department and the career level that you are applying for, you will have to go through one to three job meetings. Have a meal at one of the Chuck E Cheese restaurants and try to observe what the employees do. 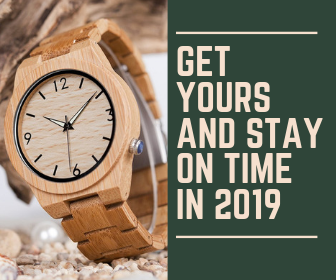 Get to know as much as possible about their products and special offers. Try to correlate the main elements in the job requirements with the most important items in your resume. Get to the interview venue, at least, a few minutes before the scheduled time because being sweaty is not the ideal way to get through a job meeting. Take a look at these examples of questions used in previous job meetings and then start practicing your interview answers to improve your performance. Why have you chosen to apply for Chuck E Cheese careers? Did you go to Chuck E Cheese restaurants as a kid? Which would you say are your greatest strengths and weaknesses? Hey My Name Alneisha Hurd. I Feel Like Y’all Should Hire Me Because I’m very easy to work with. I’m very hard working .I love kids and I need a job to help my mother out on this . You should contact the person who interviewed you, or check your online application account, if you created one when you applied. If you have created an online account on the Chuck E. Cheese career website, you can usually see at which stage in the hiring process you are. If not, contact the manager or HR representative of the location you have applied for.